Reminiscent of a hearty Saturday morning breakfast, this sweet and savory coffee delights the senses with the smell and taste of home! 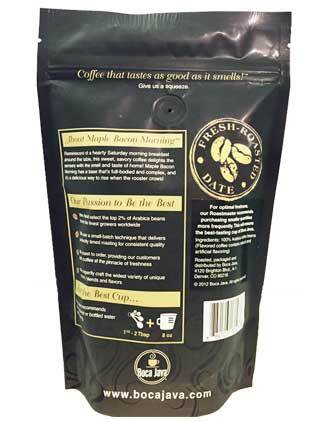 Maple Bacon Morning coffee combines our 100% Arabica coffee beans with the comforting flavors of maple syrup and bacon. It has a base that's full-bodied and complex; a delicious way to rise when the rooster crows! If you enjoy our Maple Bacon Morning flavored coffee, our Roastmaster suggests you also try our Bananas Foster Float Coffee. 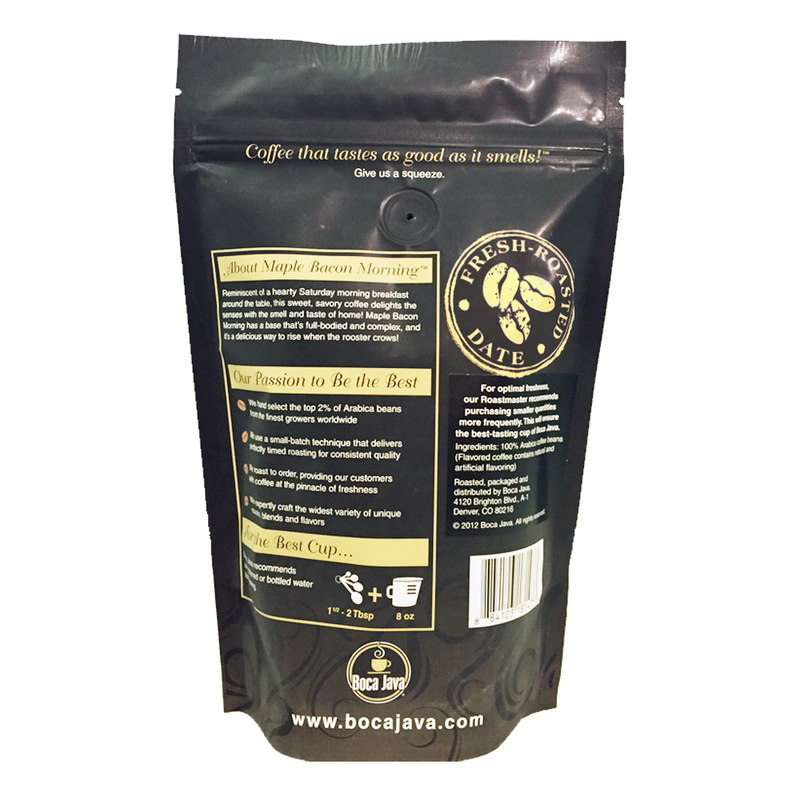 All of Boca Java's flavored coffees are sourced through a Direct Trade relationship with farmers in Nicaragua. This means that we go direct to origin and pay a premium price directly to the farmers. This ensures we can source the best beans, but also it means that these farmers (who typically live in poverty) get more money in their pockets to put back into their communities and the environment. Watch our Direct Trade, Coffees-for-a-Cause Video to learn more. Read more about Direct Trade. Maple Bacon Morning is our most popular bacon flavored coffee, though we only have one ;), subscription by our Coffee Club members. 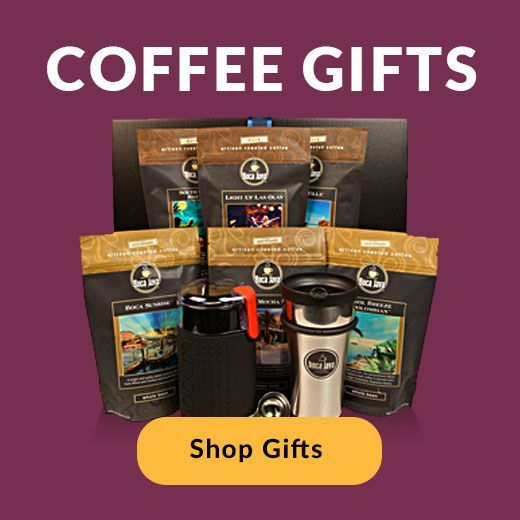 Learn more about our Coffee Club & subscribe to your favorite coffee! - All Coffee is Roasted to Order. We want you to enjoy coffee the way it was meant to be enjoyed, fresh and full of natural flavor. That's why we don't roast your coffee until after you order it! - Boca Java only sources from the top 2% of specialty grade Arabica coffees in a given crop year. We seek out the highest quality beans and use roasting techniques that bring out their fullest, most delicious flavors. With 400 Million cups of coffee being consumed daily around the World, there's 400 Million opportunities to make a difference in the lives of coffee farmers. Boca Java promotes, believes in and practices sustainable and ethical farming and sourcing practices; Is socially responsible in everything we do; and is always 100% roast-to-order coffee. We don't roast it until you order it. This is the freshest coffee you've ever had. Love, love, love this coffee! Love everything about this coffee! Great taste and smell. Bacon and coffee lovers always win with this one! Will buy again and again. I love this flavor--the maple and bacon are a great pairing and the roast is just right. Absolutely recommend! I felt that I owed it to myself to try something different. Bacon flavored coffee? I found it to be fantastic. The after taste is more maple than bacon and quite delicious. Love the smell and taste . I actually reordered more so I could send to my sister in NC . She absolutely loved it !! Loved this coffee , definitely on the to buy again list . The smell it's amazing. Not much bacon flavor but love the maple taste. This is now a staple at my house. Love maple, love bacon.. how could I go wrong? Great for AM or night with additive!! Excellent morning coffee. Have this coffee every morning. Every day when I take this to work, my coworkers comment on how it smells like maple. I can taste and smell the maple, but I can't really taste the "bacon" part of it. It's not salty, it's not smokey... Doesnt really taste like meat. I think it's a good flavor, but I would maybe add a smokey/salty flavor. Does not leave a nasty after taste. Smooth and not too bitter or dark. Maple Bacon in the morning... my favorite flavor of coffee!! it was very tasty and a nice change too. I was worried it might be too mapley or too sweet for me, but it was great! It did not add any sweetness, just flavor! I have paired this product with another product, Double Dark, so I can get the flavour of the maple bacon, with the deep chocolate taste of the double dark. Smells amazing, yet the flavor is not overpowering. I will be buying this prodcut again!!! This product was recommended by a co-worker and I'm very thankful for that. He told me that you could taste and smell the maple for a while, even after the cup is gone. I had my doubts...but he was right. It was delicious! This is a definite rebuy. Omg ...This coffee is awesome. The maple bacon is such a GREAT combination .. This is a must get coffee for your morning boost! First wake up coffee of the day. It's a wonderful fragrance of fresh coffee combined with the hint of pancakes and bacon! Wonderful way to open your eyes and senses! I buy the whole beans and ground them myself. This is the best coffee that both my wife and I like. I have a drip coffee pot and have used in old fashioned perk. Really Great Maple and Bacon Flavored coffee! Makes the whole house smell like bacon. Java Junkies this is it! This truly is my favorite coffee if all time. The aroma is amazing...Reminds me of a great breakfast! Bought this for my boyfriend and he said it was perfect! Boca Java's Maple Bacon Morning coffee has just a hint of bacon. Drink a cup of it with bacon and eggs and it really brings out the flavor. It is superb! At family gatherings, everyone compliments this coffee. We love it! I was skeptical about this flavor when I ordered it but was pleasantly surprised. Even my hubby, a non-coffee guy, likes it. Sounds like an odd flavor to buy but it is actually very good. Delicious coffee throughout the day. I love the smell and taste of this coffee! I have used this coffee for several years, and I have no reason to try any other flavor. Bacon Maple Morning is perfect for my husband and me. We love it and everyone we serve it to loves it, too. This coffee is great at breakfast time! Great aroma to wake up to. Subtle maple and subtle bacon flavors- makes the kitchen smell great when brewed. Both wife and I enjoyed, thanks.